Understanding Dogs is now 8 years old, and our client base grows month by month. If you aren't sure about how to deal with a "problem", please just call or e mail me for a chat. Most owners that I meet start with the question - how can I stop my dog ....? This is usually the wrong first question. Understanding WHY a dog behaves the way it does is necessary before we can make long term and lasting changes to a behaviour. When people talk about "training", predominantly they are concerned with things such as puppy socialisation, recall, lead walking, sit, stay, etc - all the things that we need to teach our dogs so that they can live happily in a family home. And of course owners often go further with training, expanding into more demanding skills such as agility, gundog work, competitive obedience, etc. Behaviour cases however are very different. Dogs with behavioural issues often cannot be simply "trained" to behave differently - this is why it is essential that anyone seeking help with a behaviour problem does so from a qualified behavourist. We promise not to ask you to throw cans of gravel at your dog, yank him around on a choke collar or stand in his bed/deny him access to his dinner to teach him who's boss (yes, really, some "trainers" say this sort of thing!) in an attempt to change his behaviour. In return we ask you to trust that we have you and your dog's best interest in mind and that we care that you achieve your training goals. Of course, the boundaries between a need for training and a need for behavioural modification are often not clear cut. If you are unsure about what would help you and your dog most, please contact us. IMPORTANT MESSAGE re - CONTACTING THROUGH THIS WEBSITE. I am delighted when I hear from people through the website contact form, but I need YOUR email address to reply- this website keeps you secure by not releasing that information in the form. Please include your address in your message. Thank you. Recall? Lead Walking? Calmer behaviours? A 5 week block of sessions to help with the above. Not sure if agility is for you and your dog? Want to give it a try? on request for any training topics. 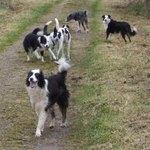 PLAY & FUN TIMES, - bonding with your dog, understanding what makes your dog tick! Behavioural problems such as food guarding, aggressive episodes, separation related issues, etc. and Lifeskills training.